Looking North (more or less) from the side of Paradise Mountain. 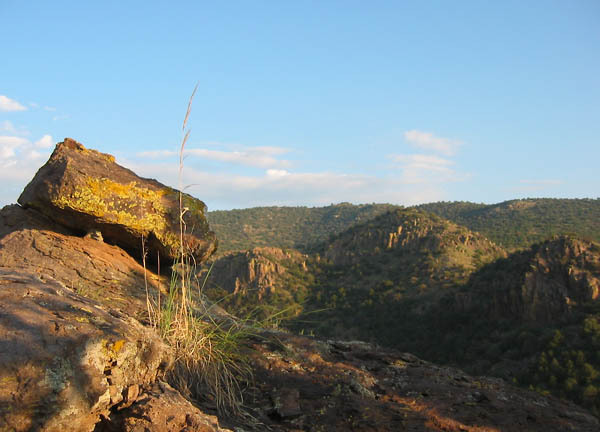 Sybil and I own five acres on the side of Paradise Mountain in the Davis Mountain Resort, near Fort Davis, Texas. This is where McLaren and his Republic of Texas people took two folks hostage a few years ago. The incident depressed land prices for a time, and we took advantage of this to buy our property at a very reasonable rate. There was an old trailer on the property when we bought it, but we removed the trailer and built a small cabin in its place.